Kofta is a Middle Eastern recipe of any sort of ground meat. 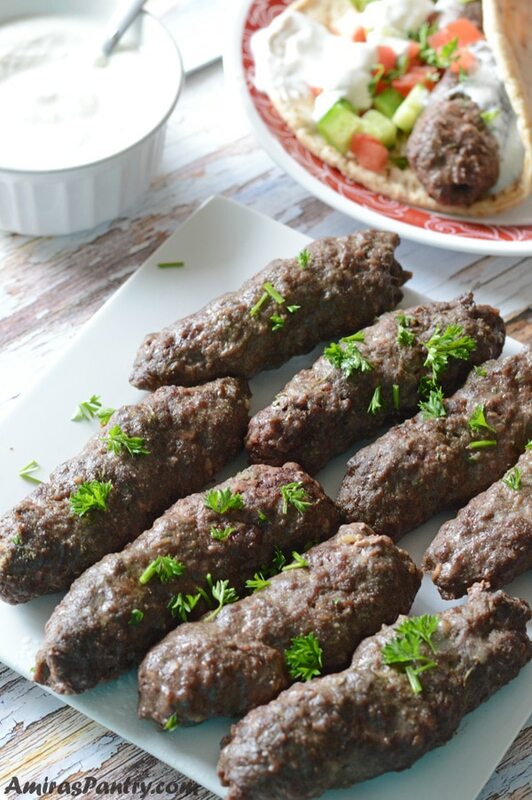 Kofta kebab is generally ground beef with bulghur formed onto skewers and grilled. 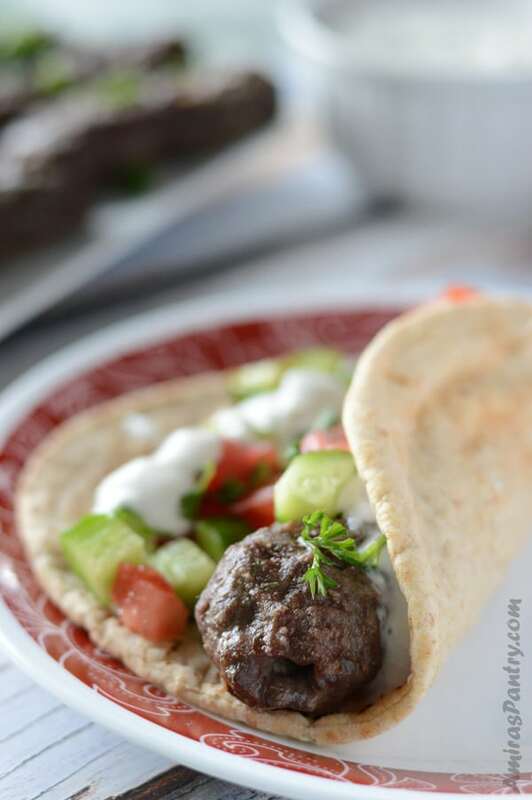 This is how I make soft oven baked (or grilled) kofta, the juiciest you’ll ever have. Grilled ground beef is spiced up and flavored to get more exotic and interesting than your same old meatballs. Grilled, pan-fried or baked in the oven this kofta turns out great anyway you cook it. A crowd-pleaser and kid friendly all year long. 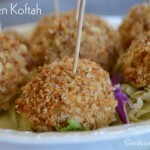 Try this amazingly flavored chicken kofta skewers. Kofta is a very popular recipe throughout the region. Every Middle Eastern and his/her mother has their own recipe. This is my mom’s and her mom’s and her mom’s…..recipe with all the tips and tricks I know of. Kofta kebabs are usually made with a mixture of beef and lamb. Some use 50/50 others prefer 85/15, I like the latter. Because my family and lamb still does not have a good relationship I do not use lamb at all. To compensate for the fat I use a 80% lean ground beef. Kofta is usually and traditionally made into cigar or log forms, but you can shape them into rounded meatballs to avoid any inappropriate comments and giggles from kids … if you know what I mean. You can even shape it into a patties to make a middle eastern burger. Here are my family’s tips for making a soft and juicy kofta. Many grannies in the Middle East know these tricks and it is going to make your kofta stand out … trust me. Yes, a bun you read it right, my mom, grandma and even great grandma used to soak a piece of bread in water until it softens then squeeze the water out and mix it with the ground meat and do not worry it will not appear as chunks in your meatballs. Some people soak the bun in onion water to make it tastier. This I’ve found to be a very good tip as it helps in shaping the kofta and maintaining its shape. This little amount of flour also absorbs unneccessary liquids that might cause the kofta to break apart. I like cooking kofta in the oven for 10-15 minutes before grilling them for another 5. Covering the pan with foil and letting them cook in the oven helps kofta to stay tender and juicy and not to dry so fast also it prevents sticking to the grill racks. Then you just put them on the grill to get those grilling marks and to brown a little more. My late brother in law said that kofta has to have lamb fat, so you should use half beef and half lamb or use 85% ground beef and 15% pure lamb fat. If you’ve been following this blog long enough, you probably know by now that we cannot tolerate lamb. I try to overcome this issue as I said before by using 80% lean ground beef. After chopping onion, if you can squeeze the water out, then mix in the onion. Do not throw the onion juice, use it to soak the bread, and use it even more while shaping your kofta. Some even brush the kofta with the onion juice. My mom loves to chop a small bunch of fresh parsley and mix it in with the meat, it gives it a desirable taste and enhances the flavors, but I did not have any this time. Some people like to use bulgur instead or with the bun– simply soak bulgur for 30 minutes then squeeze the water out-, this tip came from my mother in law a few weeks ago which got me rave reviews on our latest gathering, and everybody kept asking what is the secret to such tender kofta, but in this case I only used half a bun for the bun tip. What is kofta made of? Kofta is usually made of minced meat, spices, onion and sometimes garlic. Meat can vary from beef, lamb, chicken, turkey, pork, shrimps, seafood combination and even vegetarian and vegan varieties..
Usually made with lentils or beans minced with some vegetable and spiced up to perfection. Served in any sauce like yogurt,curry sauce or tomato sauce. How do I bake a kofta? Last time though, I did not have time to put my kofta on the grill and it turned out even better!! Again friends asking me what have I done?, seriously guys!. I’ve received two emails asking about making it without a grill and here is my tip for oven cooking. 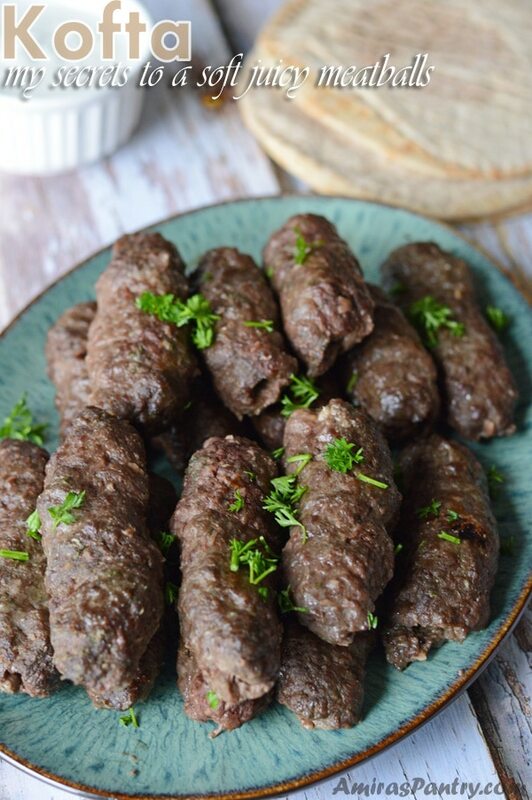 Preheat oven to 350, place the kofta on the middle rack for 15 minutes, then move up to the upper rack for 10 minutes but do not turn the broiler on. Of course, every oven is different so just use your cooking senses or meat should reach 160 degrees F on an instant meat thermometer. What goes with kabobs for dinner? 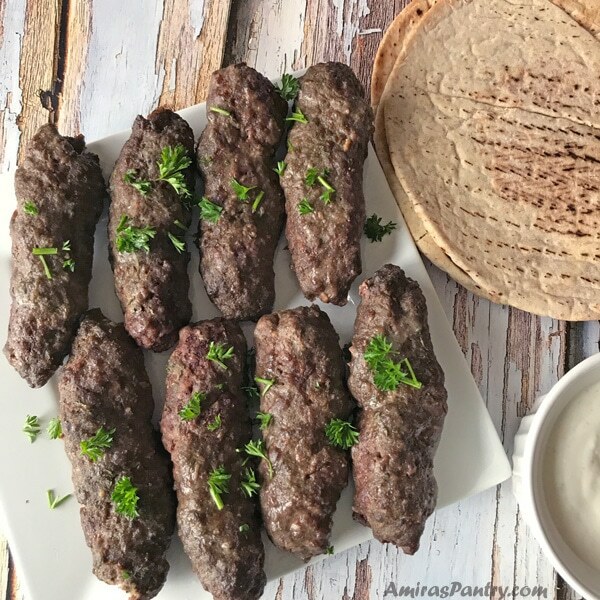 I make this recipe 3-4 times a month.. yes probably this goes on the menu each week just because my kids love kofta so much. I serve it with a side of pasta and for us we always have pita bread. Do not forget dips and sauces, Tzatziki sauce, hummus , tahini and baba ganoush goes very well with any sort of kabobs you have. Squeeze the water out as much as you can. Add all the ingredients together in a deep bowl. Mix them well together by hand for at least 10 minutes, our ancestors used to use a mortar and pestle to do this. If this is going to be hard for you then you can use a food processor as well. Shape the meat mixture on skewers or a rounded handle of a wooden spoon. Lay the cigars on a baking sheet or any oven safe dish. You can freeze them in a single layer until firm them place them in a zip-lock bag. Or you can go ahead and cook them as directed. Kofta Bharat along can be found in any Middle Eastern market. This Sadaf Brand Kofta is the closest to the one I’m used to. It is well balanced for our palates. Slow cooker Kofta with potato. This is not just another meatball recipe, I will share with you my family’s recipe for a tender and juicy kofta, that everyone has been asking me about. The is the Arabic version of grilled meatballs, tender and juicy. 1-2 medium onion finely grated. 2 teaspoons salt. or to taste. Soak the bun in water until soft. Squeeze water out of the bun and add to the meat mixture. Cover the kofta with aluminum foil and cook in a 350F oven for 10-15 minutes. While the kofta are in the oven, fire up your grill on high and grease the racks well. Place the kofta fingers on the grill for 5 minutes or less to take the grilling marks and be browned. Enjoy with your choice of side dishes and dips like toomeya, taktouka and tahini sauce. 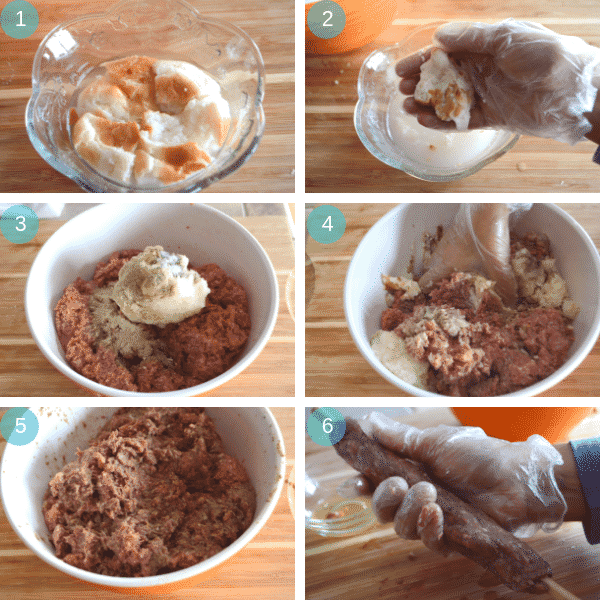 * Personally I use a wooden spoon and wrap a handful of the meat mixture around and shape it into fingers. Wow! 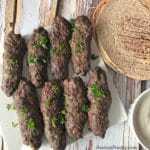 I made this Kofta yesterday and followed the cooking instructions of baking then grilling… the moistest most amazing taste ever! My husband was squealing with joy! Thank you my princess! Amira, I like your name hehe, thank you so much for your feedback. I am happy that your love liked the recipe. I made this tonight for the first time. 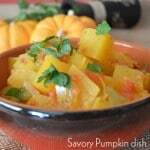 It was fantastic, as have been all the recipes I have tried that you have shared! 🙂 I didn’t have any baharat, but I substituted it with the same amount of el ras hanout that I had picked up a while back from our local middle eastern store/market. I used a potato hamburger bun that I soaked in the onion juice I squeezed out of the onions I diced finely in the food processor. I cooked it like you recommended, with 15 minutes covered with foil in oven and then a few minutes on hot grill. I was surprised that the meat still looked pretty raw when I took it out of the oven, so I left it on the grill a bit longer to make sure it was cooked through. I served it with basmati rice that I cooked with a cube of beef bullion. This dish is similar to Persian koobideh that is one of my favorite foods. I have had a lot of trouble keeping the meat from falling apart on the steel cooking swards I used for koobideh, so this was a lot easier and the taste was just as good if not better. I also followed your example of oiling the wooden handle of a spoon and using that to form the meat loaves. I really appreciate your recipes, the tips you give, and the short videos you provide. 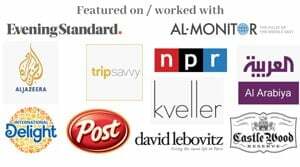 You make it easy to follow and it so much better than using recipes from a cook book. Everything I’ve tried has been so good! Thank you. Mike, thank you so much for your comment and feeback.. this is awesome!. I love koobideh so much too. I’ve always wanted to try ras el hanout and this is a great way to try it.. thanks for the tip.